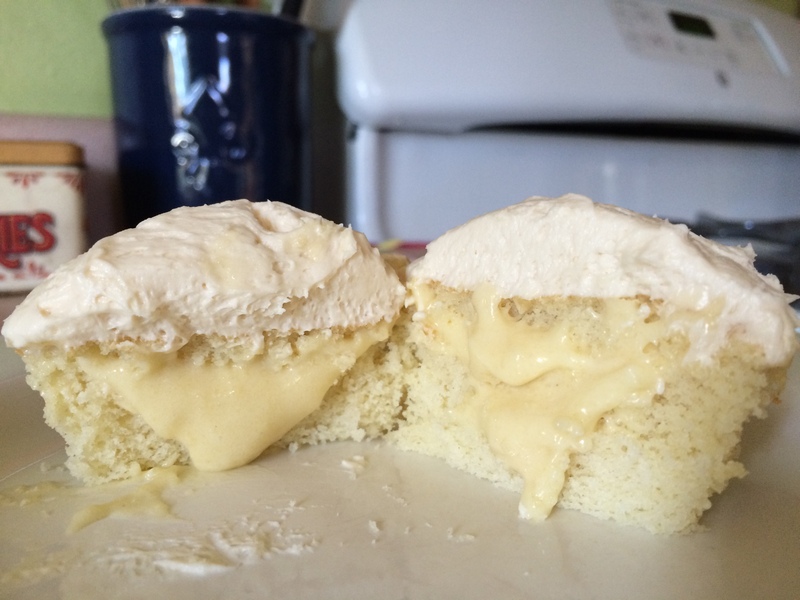 As I mentioned in my last post, there are lots of recipes for pastry cream out there. I made this one as a backup, in case this recipe for pastry cream didn’t work out. Fortunately, they both turned out very well, and this one went into the triple vanilla cupcakes you see at left. Again, timing is very important with pastry cream, and you’ll be surprised how quickly that foamy mixture thickens, becomes glossy, and teeters on the brink of being overdone. Go with your gut – if you think it’s done, it probably is, so stop stirring for just a second and see if there are large bubbles bursting on the surface – if so, it’s done! Place a heatproof bowl and fine mesh sieve next to your stove. In a medium saucepan, heat milk over medium heat until warmed and wisps of steam appear; do not allow to simmer or boil. In a 4-cup glass measuring cup, combine sugar, flour, and salt. Add egg yolks and mix well; mixture will form a thick paste, and it can be crumbly or smooth – the most important thing is for your ingredients to be well-mixed. Slowly pour heavy cream into egg mixture, whisking constantly, then return the mixture to the pan and cook over medium heat for 1-2 minutes; mixture will look foamy at first, then will become thick and glossy. Once the mixture becomes thick and glossy, remove it from the heat and whisk in vanilla extract. Pour the pastry cream through the sieve; you’ll need to stir and press firmly to get it to pass through. Press plastic wrap on the surface and allow to set up overnight.